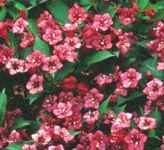 Deciduous shrub with a wide spreading habit and pink spring blooms. Hardy to -20F (-28.8C); height: 8ft. Carmine red trumpet-shaped blooms on an upright shrub. Pretty specimen plant. Hardy to -20F (-28.8C); height: 7ft. 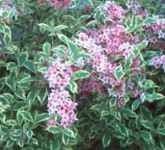 Pretty mounding shrub with dark green leaves edged in white and pale pink trumpet shaped blooms. Hardy to -20F (-28.8C); height: 4ft.